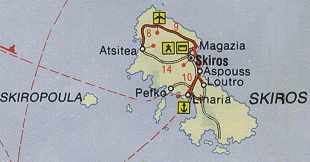 The most easterly and the largest of the Sporades. 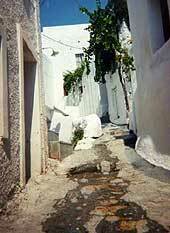 The capital is more like a Cycladic village than the villages on Skiathos or Skopelos. The white cubist houses with flat roofs are built on a steep slope with a Venetian castle on the summit. In the chairs and stools. Skiros embroidery is also much in evidence. Some of the best island folk art is contained in the Fastaitz Museum near the castle one of the best if it's kind in Greece. A herd of wild ponies, descendants of the ancient breed called Pikermic and akin to Shetland ponies roam the island. King Lykomedes ruled ancient Skiros. It was he who treacherously killed Theseus, King of Athens, by hurling him over a cliff into the sea. The island's main port is Linaria. 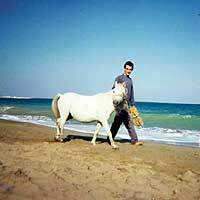 There are many lovely beaches and low mountains to explore, caves for some underwater fishing, and even ponies - the only ones in Greece. At the tavernas you can savour fresh fish, lobster and the local cheeses. 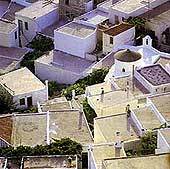 The town of Skyros, also called "Horio" locally, clambers up a hill in a white half circle, like an ancient theatre. On its top stood an ancient acropolis, one of the best strongholds in the Aegean. In Byzantine times it turned into a fortress. There are remains of Byzantine and chiefly Venetian fortifications to be seen today on the site. In Horio, there are two interesting museums: an archaeological as well as an historical and folkloric one. Every skyrian house down to the poorest, is a living museum of popular art, with beautiful handcarved furniture, embroideries, baskets and all kinds of handicrafts. Also of great interest is the original architecture of the houses, with their pebbled entrances, picturesque roofs, hearth and other impressive features. In the folk art shops you will be able to find beautifully hand-carved stools, embroidered articles, hand-woven materials, rugs, original clay and copper utensils, chests and furniture. Skyros can boast a lot of fine sandy beaches with excellent crystal clear waters. Having as a starting point the Xenia Hotel, you can go swimming to the very near Magazia Beach and Molos or walk further along the same shore as far as Girismata. The more distant beaches of Ahili, Aspous, Kalamitsa, Tris Boukes (where the grave of the English poet Ruppert Brook), Pefkos, Kyra Panagia, Atsitsa and Aherounes offer excellent bathing and can be reached by car. 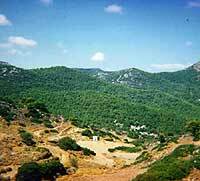 Especially in Atsitsa and Pefkos (which means Pine) the deep green of the pine trees mingle with the blue waters. In most of these places you will find small tavernas by the sea offering fresh fish, local wine and some of the island's delicacies.